Georges Albert Maurice Victor Bataille (French: [ʒɔʁʒ batɑj]; 10 September 1897 – 9 July 1962) was a French intellectual and literary figure working in literature, philosophy, anthropology, economics, sociology and history of art. His writing, which included essays, novels, and poetry, explored such subjects as eroticism, mysticism, surrealism, and transgression. His work would prove influential on subsequent schools of philosophy and social theory, including poststructuralism. 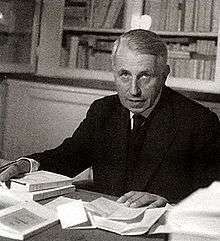 Georges Bataille was the son of Joseph-Aristide Bataille (b. 1851), a tax collector (later to go blind and paralysed on account of neurosyphilis), and Antoinette-Aglaë Tournarde (b. 1865). Born in Billom in the region of Auvergne, his family moved to Reims in 1898, where he was baptized. He went to school in Reims and then Épernay. Although brought up without religious observance, he converted to Catholicism in 1914, and became a devout Catholic for about nine years. He considered entering the priesthood and attended a Catholic seminary briefly. However, he quit, apparently in part in order to pursue an occupation where he could eventually support his mother. He eventually renounced Christianity in the early 1920s. Bataille developed base materialism during the late 1920s and early 1930s as an attempt to break with mainstream materialism. He argues for the concept of an active base matter that disrupts the opposition of high and low and destabilises all foundations. In a sense the concept is similar to Baruch Spinoza's neutral monism of a substance that encompasses both the mind and the matter posited by René Descartes; however, it defies strict definition and remains in the realm of experience rather than rationalisation. Base materialism was a major influence on Derrida's deconstruction, and both thinkers attempt to destabilise philosophical oppositions by means of an unstable "third term." Bataille's notion of materialism may also be seen as anticipating Louis Althusser's conception of aleatory materialism or "materialism of the encounter," which draws on similar atomist metaphors to sketch a world in which causality and actuality are abandoned in favor of limitless possibilities of action. Collected Poems of Georges Bataille, Mark Spitzer, 1998, 1999, Dufour Editions. Hardback is titled Collected Poetry of Georges Bataille, 1998. ↑ Robin Adèle Greeley, Surrealism and the Spanish Civil War, Yale University Press, 2006, p. 230. ↑ Creech, James, "Julia Kristeva's Bataille: reading as triumph," Diacritics, 5(1), Spring 1975, pp. 62–68. ↑ Michael Richardson, Georges Bataille: Essential Writings, SAGE, 1998, p. 232. ↑ This fact is not mentioned in the biography by Michel Surya, but see the Chronology in Georges Bataille, Romans et récits, Pléiade, 2004, p. xciv. ↑ Michel Surya, Georges Bataille: an intellectual biography, 2002; Georges Bataille, Choix de lettres (Paris: NRF), 1997. ↑ Amine Benabdallah, "Georges Bataille et le fascisme: Vers une approche psychanalytique du concept d'Homo Sacer". ↑ In an 'Autobiographical Note', Bataille describes his encounter with Nietzsche's writings in 1923 as "decisive" (Georges Bataille, My Mother, Madame Edwarda, The Dead Man, trans. A. Wainhouse, London, 1989, p. 218 as quoted in Michael Weston, Philosophy, Literature and the Human Good, Routledge, p. 19). ↑ Kendall, Stuart (2007). Georges Bataille (1. publ. ed.). London: Reaktion Books. p. 206. ISBN 1861893272. Retrieved 27 August 2014. ↑ Surya, Michel. Georges Bataille: An Intellectual Biography, 2002, p. 474. ↑ Georges Bataille, The Accursed Share, Volume 1: Consumption, trans. Robert Hurley (New York: Zone Books, 1991). ISBN 9780942299205. ↑ Georges Bataille, Madame Edwarda in Œuvres complètes, tome III, Paris, Gallimard, 1971, notes, p. 491. Petri Liukkonen. "Georges Bataille". Books and Writers (kirjasto.sci.fi). Archived from the original on 4 July 2013.